Effects: anti-inflammatory, antioxidant, helps wound healing, smooths wrinkles and improves skin appearance; liquefy bronchial secretions, expectorant. It removes spasms, expels gases, increases gastric and gall bladder secretion. Benefits: The Fennel oil is a significant ingredient of mixtures for alleviation of digestive problems, such as flatulence, constipation, colic, nausea, vomiting, anorexia, dyspepsia; its diuretic qualities help body detoxification, it is applied in treatment of renal calculus disease, cellulite and obesity (fluid retention). Helps to regulate the menstrual cycle and reduce the hormones fluctuation during menopause, stimulates the production of estrogen. It also helps to stimulate the lactation. 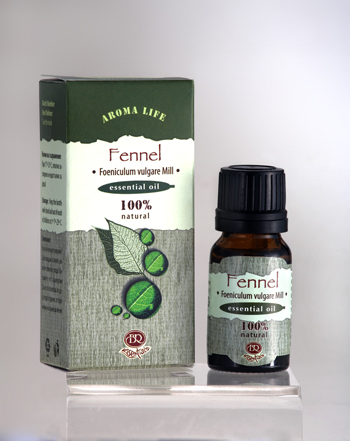 Fennel oil is an active antioxidant, it has expectorant, antispasmodic and anti-inflammatory properties. Its effects are accompanied by a decrease in blood pressure, elimination of arrhythmia. Use: massage, baths, inhalation (aromatherapy lamp), after consultation with the aroma therapist.